We're over the hump and halfway mark at Week 3 of Calling it Home's One Room Challenge sponsored by House Beautiful! 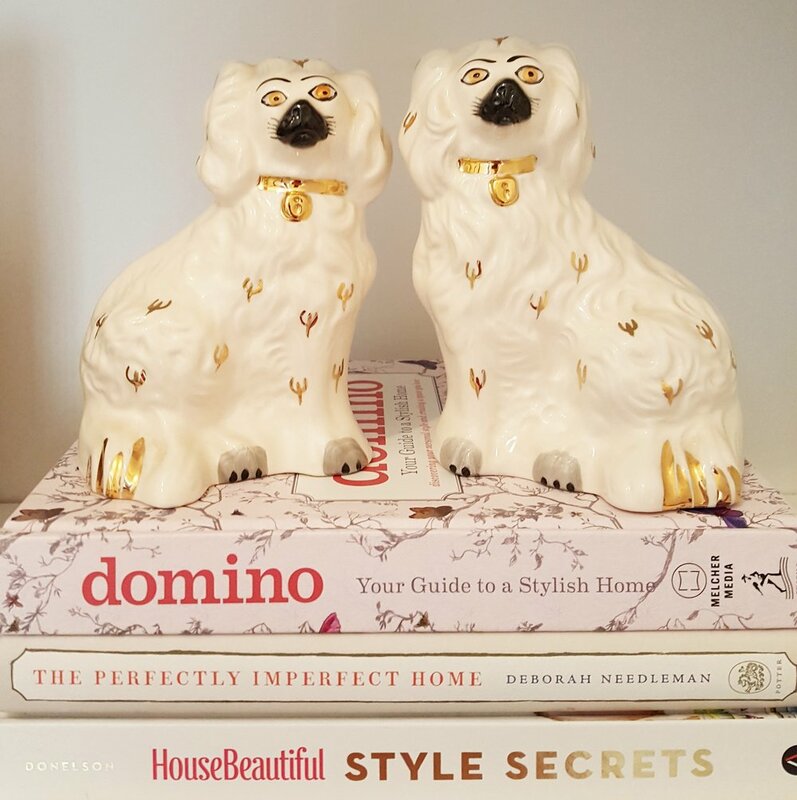 Our hardwood floors are down and cabinetry and bookcases are up and this week it's all about perfectly imperfect pieces that will add soul to the space. As a Redesigner layering pieces with history and craftsmanship that have enjoyed a previous life is important to me. 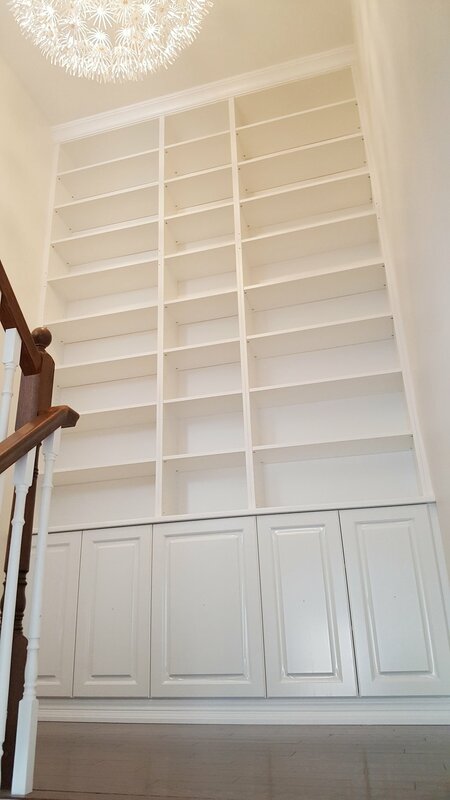 For this library project most of the stairway looks brand new - freshly painted white walls, shiny new hardwood floors and crisp white cabinetry and bookcases. I could complete the walls, floors and shelves with new purchases but I prefer a loved and layered look. Enter Kijiji, one of my favourite online sources for previously enjoyed pieces. I was able to find my dogs, rug, bench and books! I rarely buy books new unless they are stunningly beautiful (like the clothbound Penguin Classics or leatherbound Canterbury Classics) because most people don't keep them and they inevitably land at our Orillia Salvation Army, Value Village or Restore. I however, am a book lover. I have loved books my entire life and am lucky to have passed that love along to my children Matthew and Lily. Instead of buying a lot of toys that they will eventually grow out of and give away, we buy books. I was able to find some amazing gently used collections including Captain Underpants (for Matthew), Dork Diaries (for Lily) and some of the old classics with great covers - all from Kijiji. I was able to find a nearly complete set on Kijiji for $40 and continue to add to the collection. I bought them for Lily's 7th birthday this year and I think she just might love them even more than I did. Reading them with both children has opened up great values conversations about kindness, bravery, bullying and problem solving - just to name a few. Money and time well spent. I have a bit of a Canadian collection happening - with celebrated authors Margaret Atwood (The Handmaid's Tale & Alias Grace), Michael Ondaatje (The English Patient), Margaret Laurence (The Stone Angel), Farley Mowat (Never Cry Wolf), Alice Munro (Lives of Girls and Women) and so many others it would be difficult not to. I love the inscriptions that come with used books. My favourites are the really old books with beautiful cursive writing from one loved one to another and every once in a while I come across a really funny one. Orillia's own Stephen Leacock (Sunshine Sketches of a Little Town), is among the great Canadian writers and I found a great inscription in one of his books from 2000: "'Sunshine Sketches of a Little Town' is the epitome of Orillia - nothing has really changed! As a boy I met some of the characters he described" - B.L. Eighteen years later and I like to think that nothing has really changed. I love our little city! Just a couple of weeks left until the photo shoot for the final reveal and still so much to do including lighting, loading in all the books and hanging all the art - gallery style! Thanks for following and please also take a look at the progress featured designers and fellow guest participants are making with their challenges - there are so many amazing spaces!